Life and Living Skills course at Brooksby Melton College. This is for students who want to develop their independence, life skills, work experience, practical skills and self-confidence. Independent Living Skills course at Boston College. This is for students who still need to develop independence skills to prepare them for adulthood. Adult Skills course at Boston College. This course supports young adults to progress with their independent living skills. Linkage will be opening a specialist college in Lincoln in September 2017. They will offer vocational training. See Related calendar for more information and up-coming open days. Transitions The NAS have guides for starting and leaving college and university. 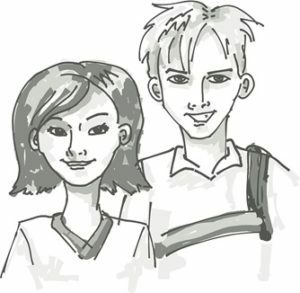 University students with Autism & Asperger’s is a dedicated resource based on personal experience. This page contains a site map. Navigating college experience This page offers general guidelines for navigating the college experience. Nottingham Trent University has a page dedicated to Autism support. Computing courses may be of interest to many. See also Wider area and Education & Training for some more options. Purpose built Learning Development Centre opened 2014. My tutors saw potential Luke found support at a local university. I live in Luton with my parents and the University of Bedfordshire is quite close, so I applied for a foundation degree there. Here is a BBC interview with two students, Tom and Kirsty, who are on the spectrum called: The autistic me. I wanted to show people that I was happier after the first show made me look unhappy and depressed. 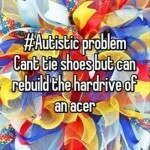 I wanted to show other people with autism are the same as normal people and can get on okay. Computers are often popular with children on the autistic spectrum. At school the subject is called ITC: What is ITC? Learner guides IT vs ICT Here is an article that considers difficulties that people with Asperger’s working in IT have drawing on some of their experiences. See also: The Science under the heading, The Geek Syndrome. Ambitious about Autism runs a project called myVoice. It is for young people aged 16-25 with autism. The idea is for you to feel at home as you learn more about yourself and your place in the wider world. There are stories, films and helpful information and advice. Click Twitter icon here to find a link to their website – it is in the left margin. Then, in the menu at the top, select Aged 16 – 25. Michael McCreary, aspie comic, having some fun channelling Joe Cocker at the Orangeville Blues & Jazz Festival. Click play button to watch or Facebook icon to browse his timeline.